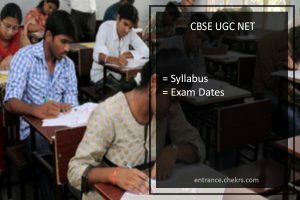 CBSE UGC NET Syllabus (सीबीएसई यूजीसी नेट पाठ्यक्रम): The Central Board of Secondary Education is going to conduct UGC NET Exam 2017 in the month of July. The aspirants will require UGC NET Syllabus for their preparations. The aspirants will be able to learn the subjects topic wise with the help of syllabus. The aspirants can check the number of questions and duration of the exam in brief with the exam pattern. According to CBSE UGC NET Exam Dates, the exam is scheduled on 8th July 2017. The aspirants are preparing for the National Eligibility Test of CBSE, they are advised to study according to the CBSE NET Syllabus Pdf. The links for the pdf are given below according to the subjects. The candidates can download the syllabus and start practising the subjects according to the topics of the CBSE UGC NET Syllabus. The Central Board of Secondary Education conducts National Eligibility Test twice in a year. The students prepare for this exam to get the eligibility for Assistant Professor or Junior Research Fellowship in the various Universities and colleges in all over India. The CBSE NET Study Material is given below with links for the download.